(Bloomberg) -- European Council President Donald Tusk warned politicians in the bloc and the U.K. not to give up on efforts to break the Brexit deadlock, even though they’re all tired of the protracted divorce. The EU last week gave Prime Minister Theresa May an extra seven months -- until Oct. 31 -- to persuade the U.K. Parliament to pass the Brexit deal that the two sides struck in November. British lawmakers have rejected the agreement three times, and May has now started talks with the opposition Labour Party to try to break the impasse. After holding a referendum on membership in June 2016 and haggling with the EU over terms of exit for two years, the U.K. was supposed to leave the bloc on March 29. After a short extension until April 12, leaders -- with the notable exception of French President Emmanuel Macron -- said at a summit last week they wanted to give a long delay to prevent Brexit cluttering up the rest of the EU’s work and to give the U.K. space to work out what it wants. The major sticking point in the Brexit deal is the so-called backstop, which aims to prevent a hard border on the island of Ireland by keeping the U.K. in a customs union with the EU until a better solution is found. It’s become central to the debate in Britain over how close to stay to the EU. The U.K. could still withdraw at any time if the deal is passed before October, but if the divorce isn’t ratified before May 23, it will have to hold elections to the European Parliament -- a symbolic reminder that Brexit is yet to happen. 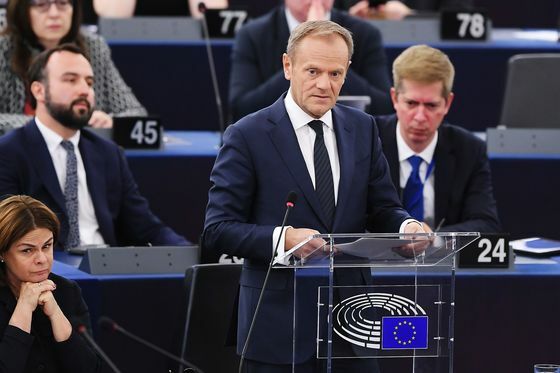 Britain could still leave the EU without a deal, causing economic uncertainty, or even reverse the Brexit process and decide to remain in the bloc, Tusk said. “The answer to the question to which path the U.K. will take will have to come from London, and the earlier the better,” European Commission President Jean-Claude Juncker told the same debate in the European parliament. But he also hinted that when EU leaders convene in October, they might still be open to delaying Brexit again if the deal hasn’t been approved. “We will never kick out one of our members,” he said. Guy Verhofstadt, the European parliament’s point person on Brexit, said in the debate that the prolongation of the withdrawal deadline to Oct. 31 risks solving nothing, while putting “at risk” the unity of the remaining 27 EU partners.